As we all know, the Badges project seeks to provide users with a mechanism to shape their online identities: showcasing the skills that they have earned over time or in the case of an issuer, the skills that they might have to offer. 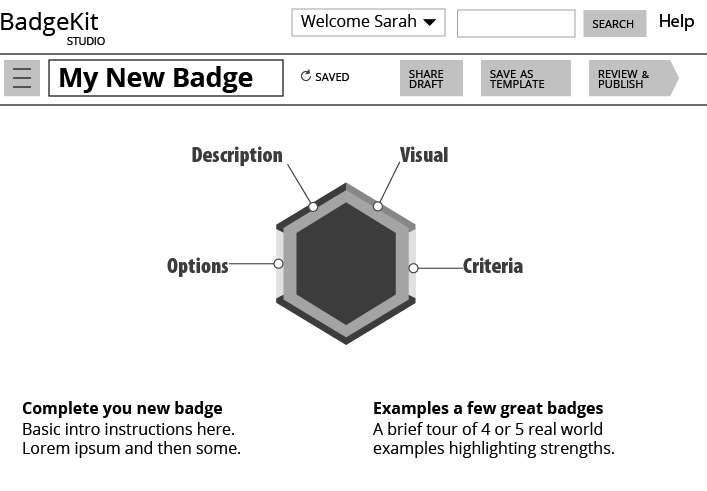 By nature, badges are a participatory design project. From its very conception, the project was designed by and for the learning, design and tech communities to help ensure that the product that was ultimately designed met their needs and was in fact usable. However, Participatory design also requires user - generated content for culmination. Every badge is, in essence, an invitation to a conversation. For example: I make a badge with some basic criteria (this is in essence a "call to action") , and then a maker responds to the call with evidence (like a photograph), and then I react to the response with a conversation about that data. Badges say: "User generated content : you complete me. " This call and response culminates in co-authorship of a badge that then has the ability to be viewed by any viewer in a way that allows them to be kind of like an eavesdropper on the conversation. This leaves us with questions about "ownership." This question is more than just legal. It's the foundation of the entire project. The notions of Participatory design + ownership require developing a community of practice around: (1) establishing authenticity (2) engaging in collaboration/remix culture and (3) attributing content ethically. Henry Jenkins said that "Everyone sees the future will be more participatory, but we are fighting over the terms of participation." I don't know what the best terms of co-creation and remixing are, however I am interested in considering the opportunity that we are providing to badge makers, who are engaging in conversation via the vehicle of the medium. Through the exploration of co-authorship and remixing practices that are already happening or are desired, I suspect that we can start to propose some options for flexible options of copyright or licensing. Before I get too far along in the solution, let me guide you through some potential use cases for participatory design within the badge making experience. be able to use my badge 'as is' and re-issue it as their own. be able to 'fork' and modify my badge and re-issue it as their own. These are all interactions that could impact a license. What is implicit here is the desire to freely circulate and allow for tinkering of content. Without the free circulation content, participatory culture cannot exist. After Connected Educators Month, Chicago Summer of Learning and general badge issuing in the Hive we know that there is a desire to "fork", "clone" or "copy" badges or parts of a badge. We have already started to deal with licensing issues with regard to badge imagery - utilizing icons from the Noun Project and Subtle Patterns, however we know that there is a large scope for metadata that could in fact be cloned or forked. Let's take a look at the badge studio wireframes to see where there are licensing touchpoints in the badge making process. These wireframes were designed by Matthew Willse and will be incorporated into the upcoming release for BadgeKit. Some of the ideas represented in these mockups will be implemented in a future iteration of BadgeKit. 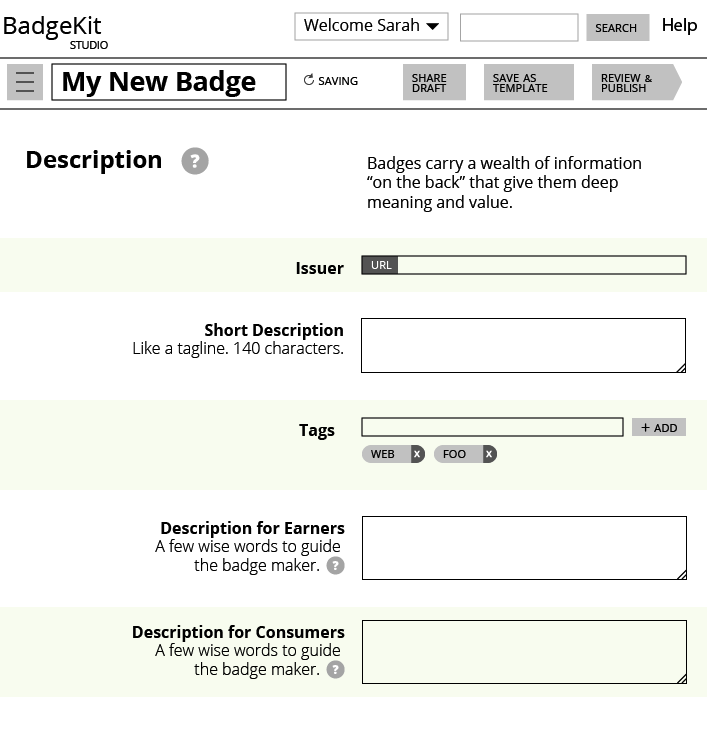 As a badge maker is using this part of the BadgeKit site, they can define many parts of the badge - from visual design to badge description. Additionally, as you can see in the wireframe, in the optional information we could enable users to add licensing and set parameters for the project. This is really not an answer to the intellectual property question, but just some context. I believe that a creative commons license is the direction that we should head with this project, however, there are many existing forms of licenses that support creative digital content and I want to go over how I came to this decision. *You can scan my overview in the etherpad. 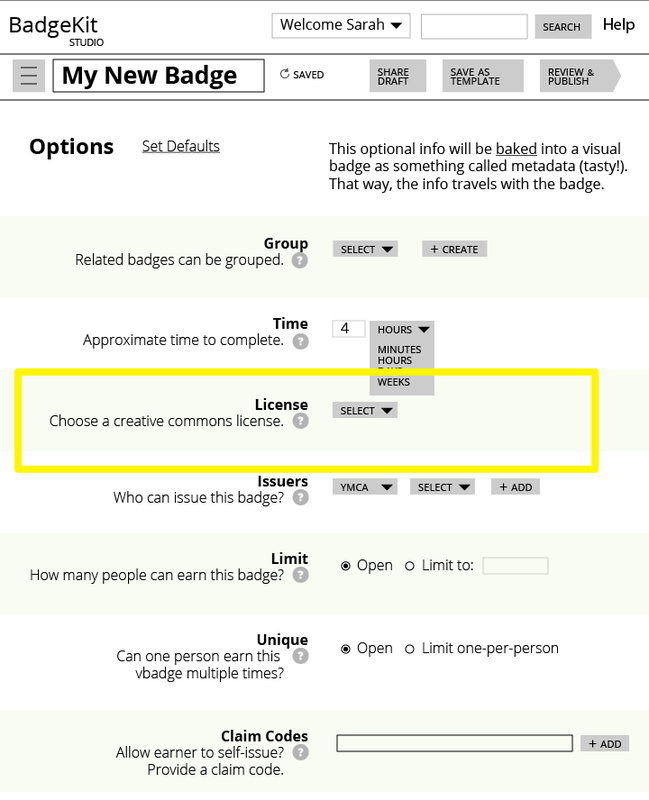 PRO: A unique license structure could allow users to badge component parts or whole badges. CON: This seems a bit over the top, considering how many great licensing frameworks are already in existence. This would be another thing that badge issuers would need to conform to, and really, who is going to police it ? The response from my colleague Michelle Thorne was so strong, I have to add it here: " Please, please, please don't make a new license! It will cause confusion and lack of interoperability. This is more restrictive than all rights reserved. Instead, consider a "badge licensing policy" which suggests how to license and attribute based on existing licensing standards, like Creative Commons." 4. CREATIVE COMMONS LICENSE -which is actually not a single license, but many licenses. Lawrence Lessig founded the free culture movement to promote greater legal freedom in the reuse of published content, which later lead to the Creative Common flexible"licenses" that offer a range of legal protections.. Allows someone to fulfill ambition of encouraging dialogue, collaboration, etc., w/o sacrificing control, etc. New, not universally recognized or understood --> I'd argue these are some of the best known copyright licenses with lots of adoption. Education space already using widely. Not made for source code. So, worth considering how to use CC for creative work (like badge design and descriptions) and source code (but not metadata) like the OBI. As I mentioned earlier, my goal is to get a sense of the options available to us so that I can incorporate it into the software. This will allow us to start to develop a community of practice around attribution. At the moment, I feel that we should go with creative commons licenses. That said, I still have a lot of questions in terms of application. For example, should the software allow for different operations to have different licenses? or What about when a badge earner submits their content for review, does this part of the conversation have a separate license? I would be interested in hearing about additional use cases for badges remixing, co-authorship and cloning and hearing more thoughts on licensing and copyright. Adrienne K. , Goss. "Student Note: Codifying a Commons: Copyright, Copyleft, and the Creative Commons Project." Chicago-Kent Law Review. (2007): 963. http://scholarship.kentlaw.iit.edu/cgi/viewcontent.cgi?article=3609&context=cklawreview. Montagnani, Maria Lilla. "A New Interface Between Copyright Law and Technology: How User-Generated Content Will Shape the Future of Online Distribution." Cardozo Arts & Entertainment Law Journal. (2009): 719. http://www.cardozoaelj.com/wp-content/uploads/2013/04/Montagnani.pdf. Elkin-Koren, Niva. "Intellectual Property and Public Values: What Contracts Cannot Do: The Limits of Private Ordering in Facilitating a Creative Commons." Fordham Law Review. (2005): 375. Loren, Lydia Pallas. "Building a Reliable Semicommons of Creative Works: Enforcement of Creative Commons Licenses and Limited Abandonment of Copyright." George Mason Law Review. (2007): 271. http://www.georgemasonlawreview.org/doc/14-2_Loren.pdf. West, Ashley. "Little Victories: Promoting Artistic Progress through the Enforcement of Creative Commons Attribution and Share-Alike Licenses. "Florida State University Law Review. (2009): 903. http://www.law.fsu.edu/journals/lawreview/downloads/364/west.pdf. Please note: I am not a lawyer, nor do I pretend to be. I am merely researching the subject.